I have a few little girls who I’ve known since they were tiny — Lindsay is one of those friends. She’s the very smart daughter of Chau, my manicurist at Creation Nails. I always give Lindsay a Christmas present — and this year’s was the same as last — a basketball. (I know it makes her popular at recess!) She came into the shop a few weeks ago and now that she’s a pre-teen, was a bit bored. I gave her a project — to write me a “Thank You” note for what she’d just opened. 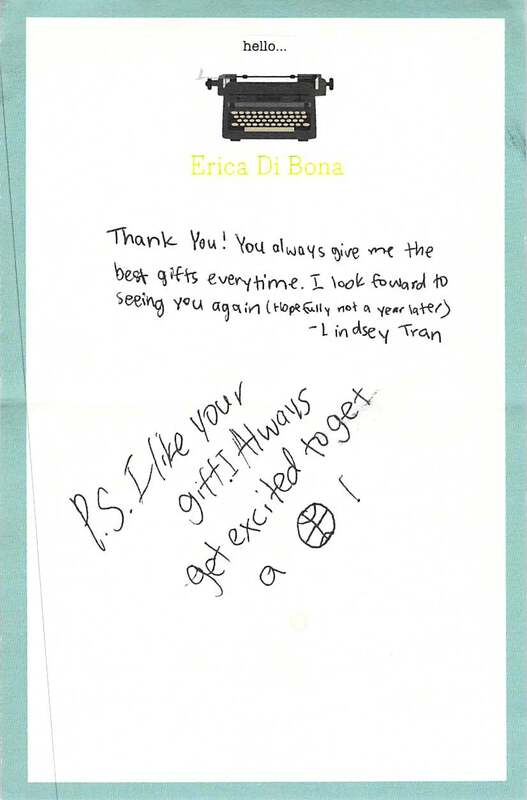 I told her about my “3 Easy Paragraphs” — to write the first one about how you felt when you got the gift. Paragraph Two: Something nice about the person. Paragraph Three: How you hope we’ll carry the gift or rhe relationship forward in the future. Lindsay came back with a half-hearted attempt, which I kindly rejected. I told her to add heart, layer in some feelings, and do it again. A few minutes later, she handed me this note — and I delighted. She explained that her cleaning lady had brought her own 13-year old son to work. The Nail Customer said, “You’ve got to have a PROJECT, you can’t sit here all day” to the boy .. and she taught him how to write a thank you note, using the same three steps I’d showed Lindsay. She said his first one wasn’t great, and like me, she asked him to re-write it. This time he got it. His mother was watching them, and The Nail Customer told her, “Don’t worry, do your thing — this is our project.” A few days later the Nail Customer got a “Thank You” from her cleaning lady, written in the same style with the date in the upper corner just as The Nail Customer had shown the boy. I had a glimmer of a brainstorm — what if all older people took it on as a project to teach just one younger person how to write a “THANK YOU”? Wouldn’t that be a cool way to pay it forward? I’m going to cogitate on my concept, but wanted to share this story while it was fresh in my mind — and my nails are barely dry.